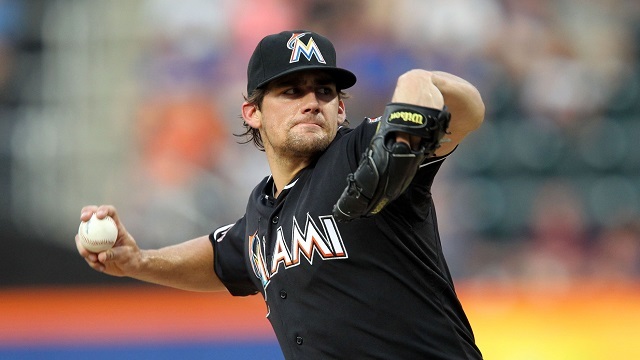 Will Nathan Eovaldi be missed as a FISH? Or will he be one that is happily relinquished to another? This is a guy that stands at 6’2″ and 215 lbs. spitting straight fire from his right arm registering upwards of around 97-99. That’s enough to get anyone hyped up about buying a ticket on the Eovaldi express. However, after last season and playing the role of Ms. Cleo looking into the future, you won’t find me standing in line to join that ride. Despite his unbelievable arm strength and ability to throw with max effort for 6 innings (if he makes it that long) he lacks something big league analysts like to call “pitch ability”. You know, that one tool needed to not just make your pitches dominant, but unhittable. Through 2014 we saw a lot of “flatability” in this guy. Meaning you saw a guy take the mound whipping up his best combination of velocity and movement, but ending up with pitches being put on a platter. Because without that tool called “pitchability” this is what we get. A guy, who even with an above average FIP rating of 3.37 in 2014 he had a jacked up BABIP that stood at .323, strung together with a K% that declined from 2013 from 17.3 to 16.6 in 2014. I know what you’re thinking, 97-99 MPH, hard off-speed and these are the numbers we are looking at? All of these numbers reflect the unwanted tool in a pitchers arsenal, “flatability”. Those of us who watched Nathan pitch this season would be remiss if we called it anything else. Don’t get me wrong he was great through 3 innings and even on most occasions getting us through 6 strong , but you would be inattentive if you didn’t see how many times that upper 90’s fastball looked like a beach ball, even on a 6″ monitor, causing his HR/FB ratio to raise up to 6.6%. Add to it his slider that was hung like the Hit-A-Way tool to hitters and belted some 400 feet into orbit and he ends up with a disastrous WAR rating of 0.7 for the 2014 season. Showing continuous signs of a lack of “pitchability”, not being able to put hitters away. Everything being equal, Nathan valiantly served a depleted Marlins rotation that started 13 different pitchers in the 2014 season. He was a guaranteed starter who totaled around 200 innings. Will he be missed? Yes, for his durability and pure fact that his roster replacement could end up being another gopher ball pitcher in Dan Haren, who carries in a HR/FB ratio of 11.9%.Leaving you to debate the real question. Are we happy to have him relinquished to another team? We will just have to wait and see what the 2015 seasons brings. But if Nathan toes the rubber strutting “pitchability” over “flatability” then it could be lights out for opponents in the AL East. Next PostHave we underestimated Avery Romero Potential?